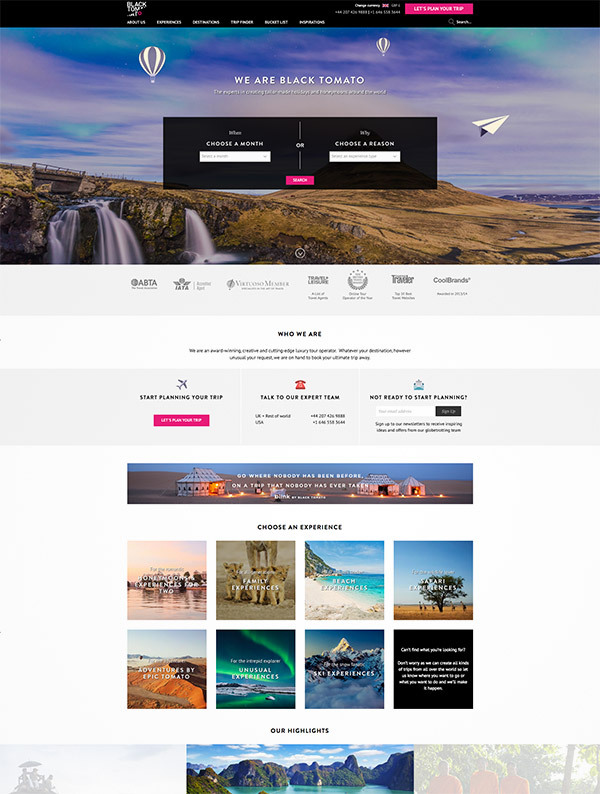 Appearance and visual appeal are the bread and butter of the websites in the travel industry. In today’s tech age, the internet is arguably the best place to advertise to people. With that said, web design is very essential for this industry and are evidently seen in well-designed websites. Whatever the purpose is, whether for resorts, toursim, villas & hotels, or agencies, the website’s design should effectively allure and capture the interest of its visitors with stunning visuals. 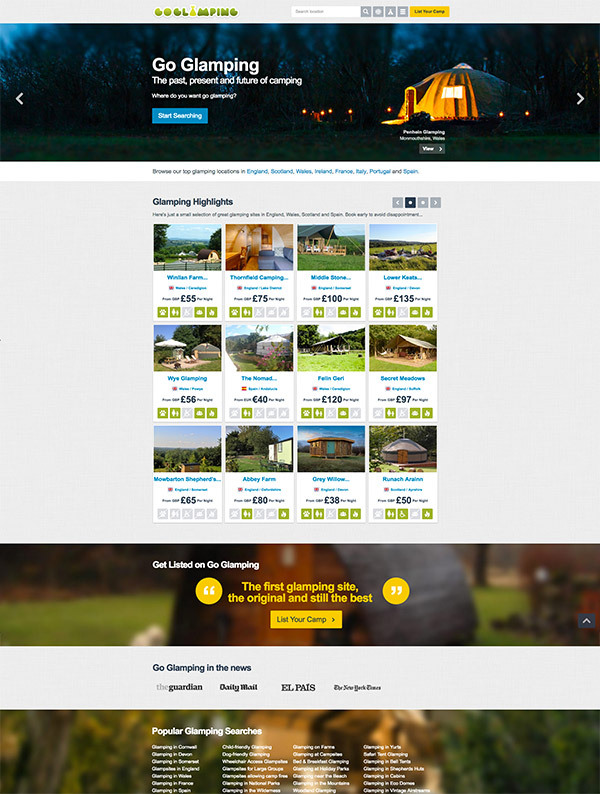 To show you some examples, we have gathered some of the best travel websites with various designs. Take a look at this list and have your light bulbs brighten up with new ideas. Come, take a peek, and enjoy browsing. Getaway’s header has a slideshow of fullscreen video backgrounds with enticing shots. It also utilizes parallax scrolling with black strips and inviting images. 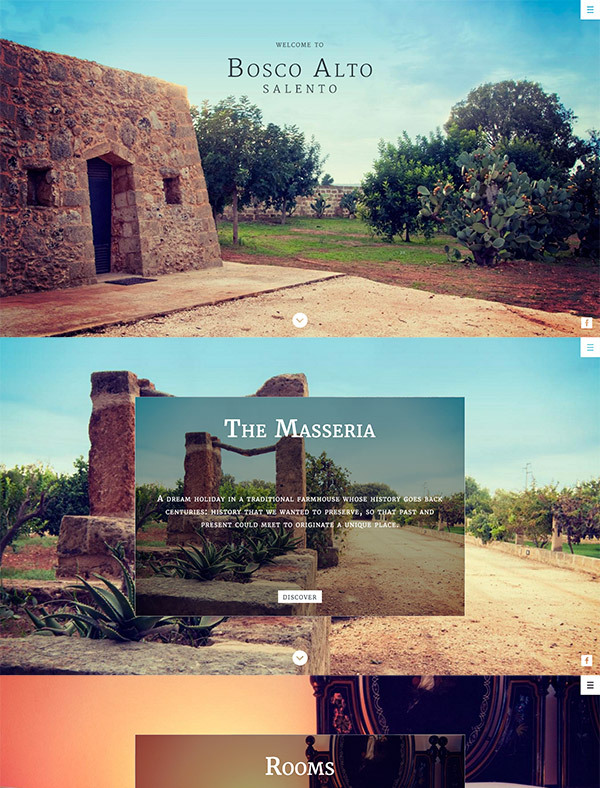 La Mezziane is a one page travel website that has a cinemagraph showing a stunning view from an infinity pool. It displays the location, the villa’s interior & exterior design, and contact formation as well. 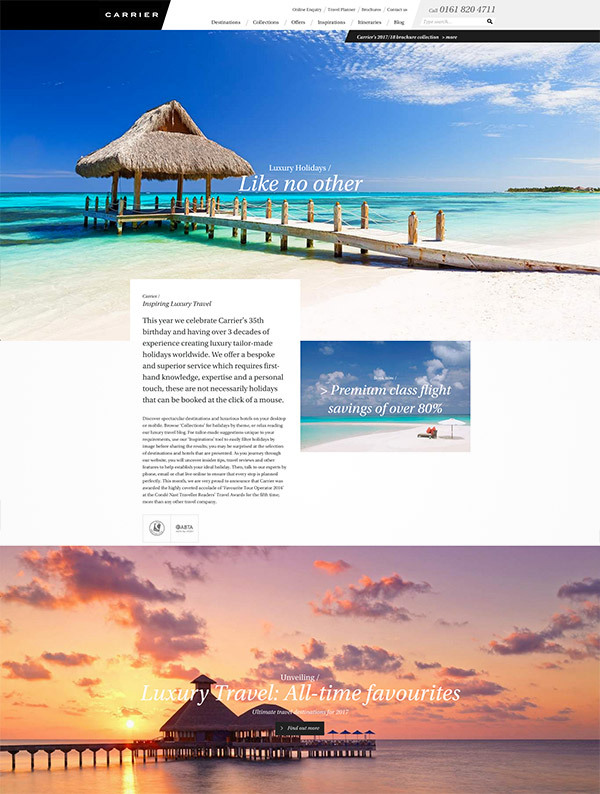 This site is from a luxury travel agency that offers various destinations. It has a fullscreen background image of a beautiful beach that is very alluring. It also utilizes alternating white and image background that keeps the experience interesting yet not overwhelming. This site has a boxed layout with background image. Its header has an image slider and it has a sidebar that displays various destinations. Everywhereist has a playful ambiance to its web design through the graphic design on the header and other elements. Tennessee Vacation has a rodeo theme with rustic image background and wood texture. Tourdust offers tours and adventures to handpicked locations that will let you experience wilderness. Its site has a full-width slideshow followed by a gallery of different destinations. Himalayan Wonders bargains tours to the beautiful Himalayas. 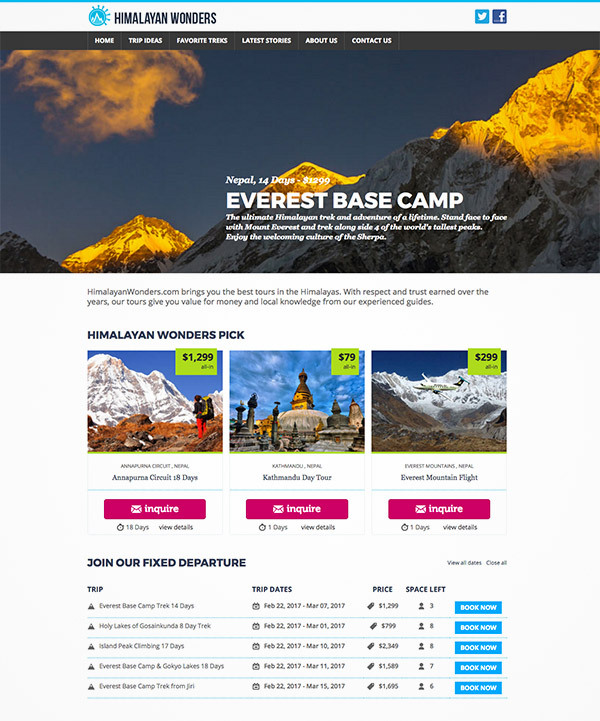 Its web design shows their various travel packages and bookings for easy navigation. Apartum uses a pattern background of various icons for its header. 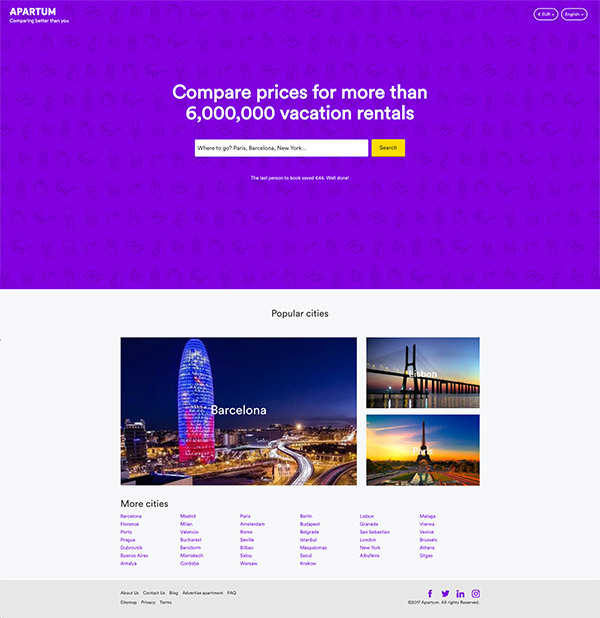 The site generally has a minimal design that shows various cities of destination. Maine also uses a video background for its header and different kinds of layout for its galleries. 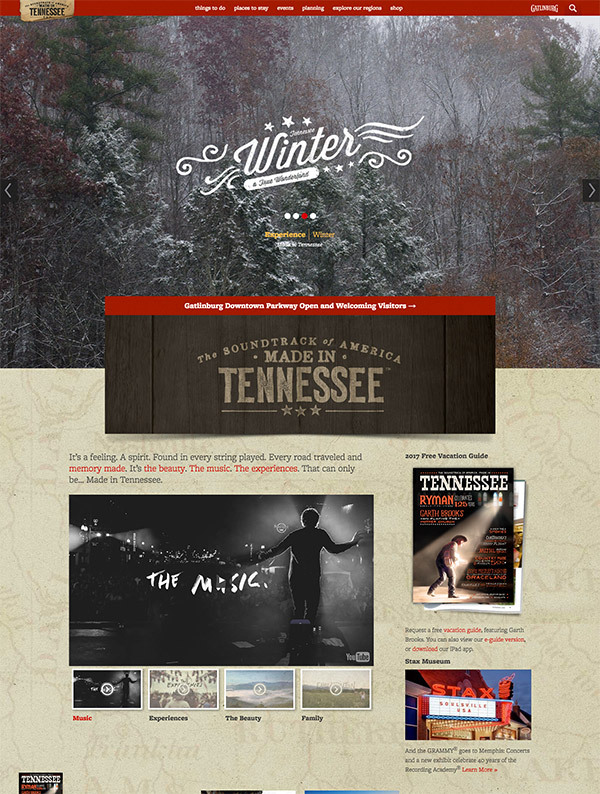 The site has an uncommon layout with a pinned vertical header on the left and the content on the right. 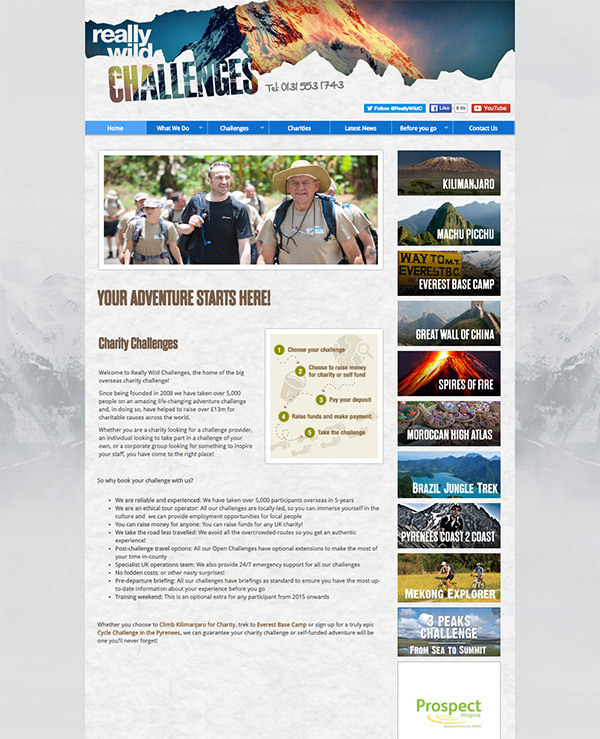 The header has video background with topography texture overlay. Go Glamping offers luxury camping or ‘glamping’. It also has slideshow on the header and a grid layout that showcases different destinations with the price and accommodation. 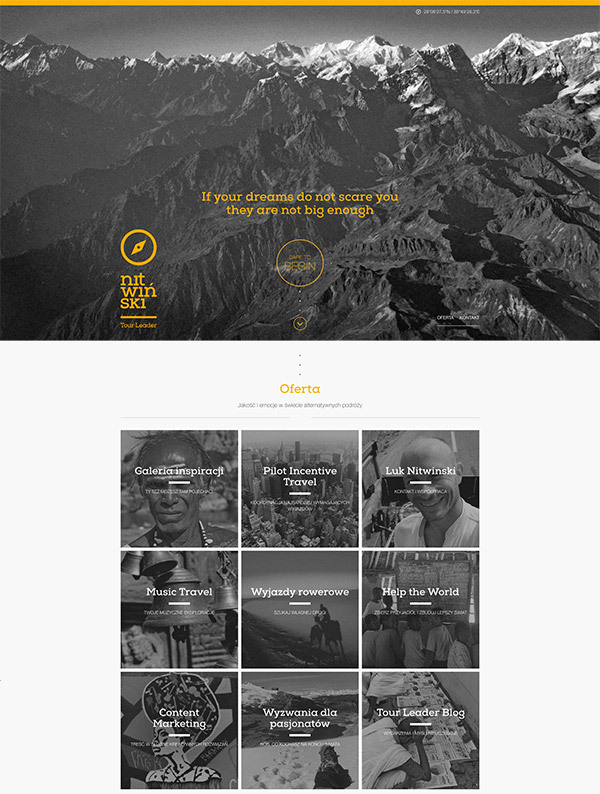 The website has a greyscale theme with yellow accents. It has a fullscreen image background in the header and a clean grid layout for its gallery. Twin Pine Journey has a vintage ambiance with parallax effect on various objects that puts some spice while scrolling. This site jives with the modern design with a fullscreen image background and a typography overlay. 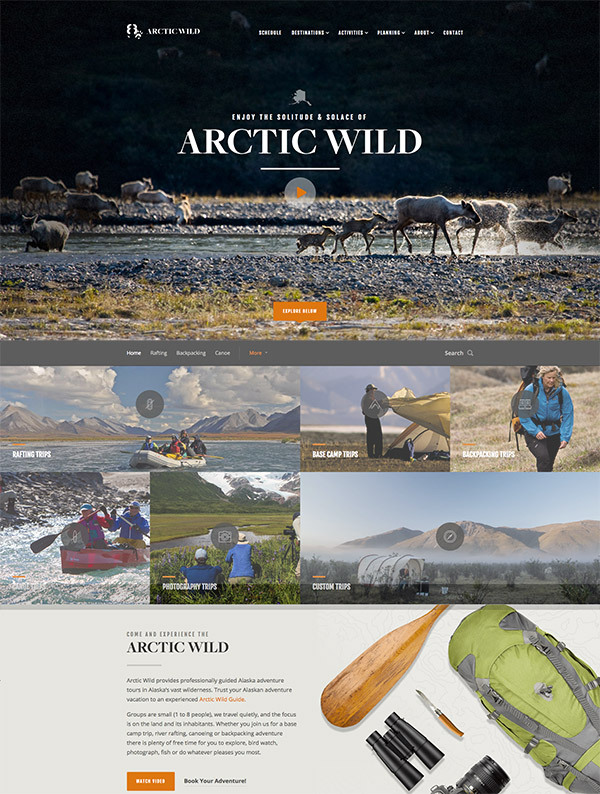 Arctic Wild has a fullscreen header that showcases a video documentation. Designer Trek is a getaway for creatives. It has a one-page website with a continuous background image and is followed with a clean layout. Bosco Alto caters fullscreen background images all throughout the content. It also has interesting transitions of its boxed element. 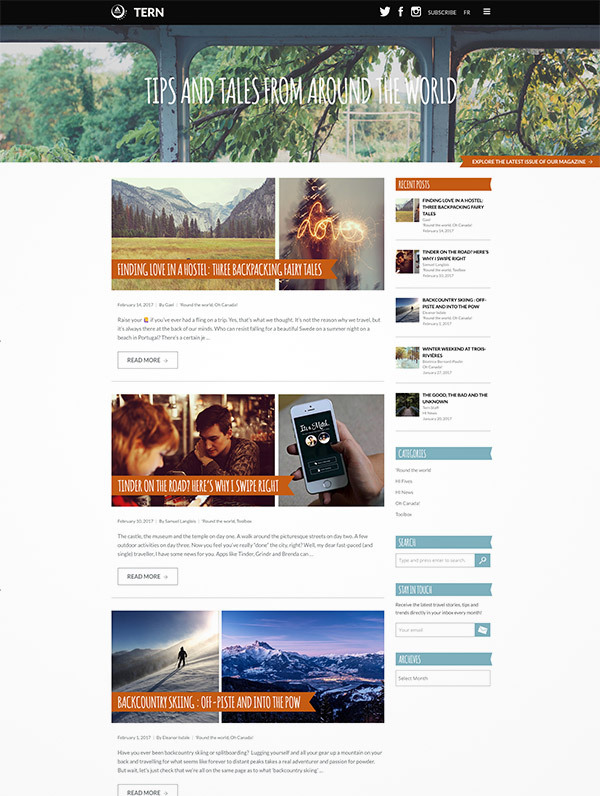 Tern is a magazine blog for travellers. It uses a full-width header with a handwritten & sans font. Black Tomato has a very beautiful design that fits the latest trends. 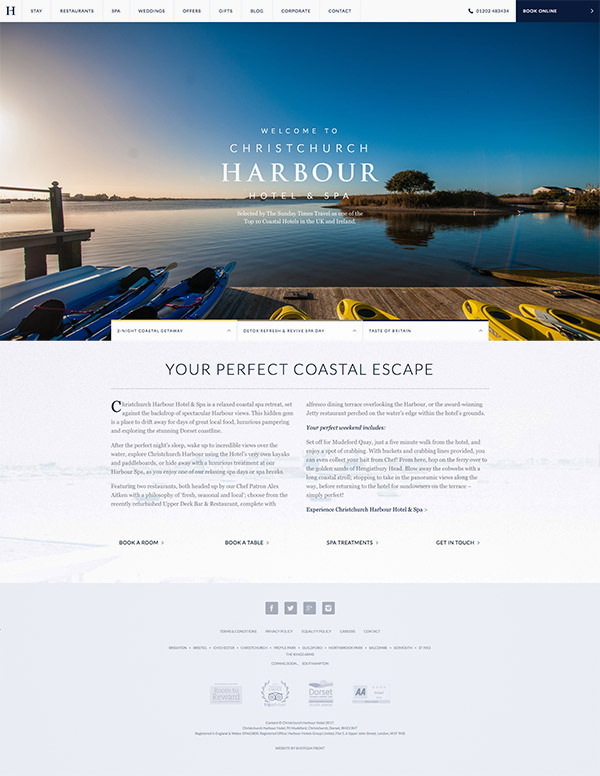 It caters various elements but still maintains a clean layout that is great to the eyes.